We have a large selection of products for the healthcare of your animals. You will find everything including products for grooming, first aid, digestion and hoof supplements. We can provide you with a wide selection of supplies for the care of hooves. Among our hoof supplements, you will find a whole range of items from Equimins, TRM, Keretex and Cornucrescine products. For the productive care of your horse's hooves, we stock the Equimins range of Hoof Mender supplements in both powder and pellet form. These hoof supplements contain a high quotient of zinc methionate, which is integral to successful and strong keratin growth. Equimins Hoof Mender supplement also includes Yea-Sacc, ascorbic acid and MSM, proven to help your horse's natural immunity and defence against infection. Also containing sulphur rich methionine and MSM, TRM Hoofmaker is packed with the nutrients required to support and protect the hoof. This supplement will nourish all of the hoof horn's layers; its integrity sustained by the high sulphur content. 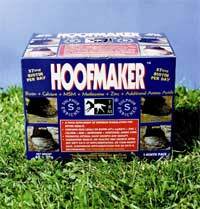 Also included in this hoof supplement is a high level of biotin, essential for the regeneration of cells. Available in easy feed pellet form, the Cornucrescine Daily Hoof Supplement contains a high content of chelated minerals and biotin. These elements are easily absorbed by the horse to ensure effective day-to-day care of the hoof. Understanding the importance of the right amount of factors for efficient hoof growth and continued, healthy protection, Keretex brings you their Feed Supplement For Hooves. This hoof supplement is brimming with vitamins and minerals, along with trace elements like copper and zinc. The benefit of these additional supplements is clear from the sustained growth of your horse's hoof. If you have any questions regarding the huge range of hoof supplements at Farm & Country Supplies, please do give us a call free on 0800 056 0002.